Do CIT Programs Help You Get Into College? More than ever, children’s summer experiences are focusing on academic programs, intensive sports camps, and internships, all with the goal of preparing children for college, and more importantly, college applications. Here at Camp Quinebarge, we offer a traditional, fun, CIT leadership program for 16 year olds – that may help your child’s college application stand out, and even prepare them for the independence of college life in a safe, supervised setting. Our Program isn’t just a leg-up for college; it’s a fun, fulfilling experience where teenagers develop life skills and make lifelong friendships. 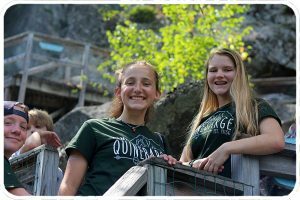 Camp Quinebarge’s Counselor-in-Training (CIT) Leadership Program offers the best of both worlds: fun, friendship, and lifetime memories at summer camp, plus skill- and leadership-building, and an addition to a college application that will stand out. We are also happy to give CITs volunteer hours if their high school or college requires them. If you ask us can CIT Programs help you get into college, our answer is yes. Cabin and Activity Support – CITs assist counselors at activities and in cabin groups, mentor under counselors, and are given the chance to lead on their own, with the supervision and support of adult staff right there if they need it. 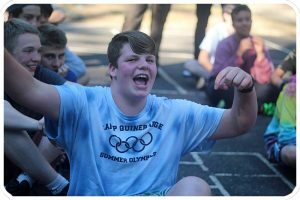 Leadership Development – Through special ‘leadership development sessions’, our CITs learn what it means to be a leader, and how to effectively work with children or their peers in a leadership role. We focus on group discussions and activities to teach leadership through experiential learning. Legacy Projects – CITs give back to Quinebarge by designing and completing a Legacy Project each summer. In the past, these have included our Gaga Pit and CIT Garden. The CITs develop the idea, plan and execute their projects, requiring teamwork, decision making and organization, the exact types of skills that are important for adults and in their future careers. While a summer job or other short-term program may provide some of those things, our CIT program encompasses many of the traits admissions officers are looking for. To see a 16-year old commit their entire summer to a residential program, where they not only develop skills but give back to their community and act as leaders is no small achievement. Let’s face it – while summer jobs are great learning experiences, not all of them are fun. Our CIT Program, though, is! CITs work together and bond as a group – they spend time off, overnight trips, and free time in each other’s company, forming close friendships. 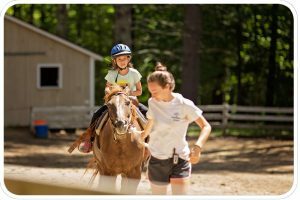 They reconnect with friends from previous years, and find fulfillment in helping campers achieve their goals or try something new. But most importantly, they go home with three things that the average summer job won’t provide: a newfound sense of confidence, responsibility, and independence; warm memories they will look back on for decades; and friendships that will last a lifetime.